Last week’s Places in Your Neighborhood trip took me (again) to the Rosh HaAyin area. The sites are fabulous and I don’t get tired of exploring them and showing off the interesting corners in the Land of Israel again and again. Every group is different and brings their own questions and points of view to the tour so I am always challenged to make that unique encounter between the group and the site. We got to discussing Crusaders. (Logical, since we were standing in a fortress – Migdal Tzedek – first built during Crusader times – Mirabel.) Crusaders came to the Holy Land in 1099 C.E. There seems to be several details missing from many people’s vision of what it meant to be a Crusader. The Crusaders as an entity were in the Holy Land for almost 200 YEARS. Think about it. If the Crusader period were to be ending in the United States now, the first Crusaders would have arrived during the 1812 war against Great Britain. The Crusaders were as firmly entrenched in the Holy Land as the vast majority of Americans are entrenched in America. They never even remembered a different life. Going along with that, Crusaders had families, wives, children. These family members were often from European stock – so it is not just the male knights who are coming as part of the various crusades, but they are bringing the whole family. Their sons and daughters marry each other and we have developing a sub-culture of European Christians in a Middle Eastern, Muslim world. This pattern can be seen in immigrant neighborhoods today. Cultural groups tend to marry from within not only because of familiarity, but also because of shared norms. 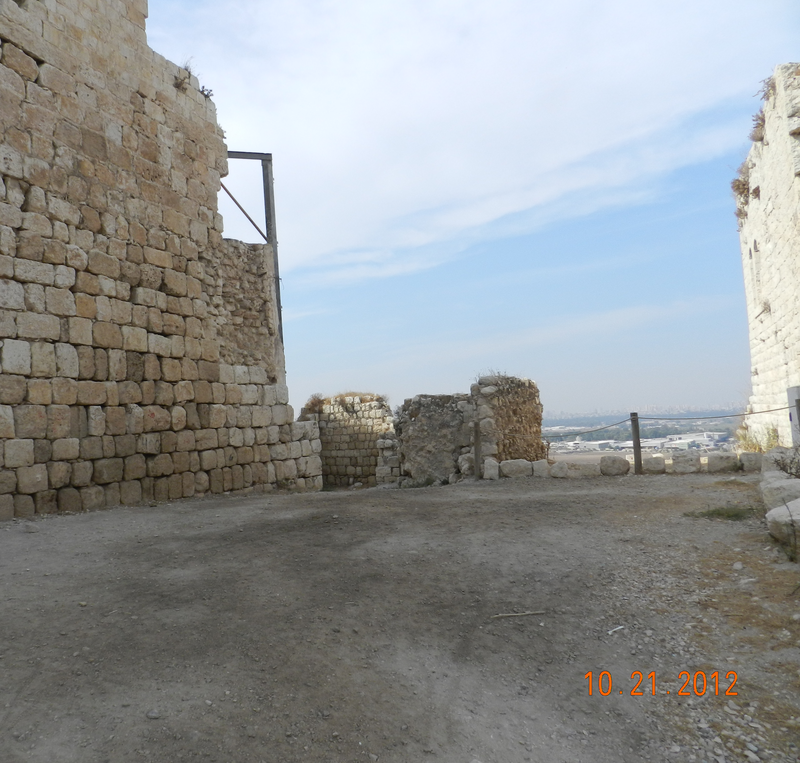 One such “intermarriage” influenced the ownership in the Crusader castle above Rosh HaAyin. As the Crusaders were a normal community in all respects, they did not always interact in a positive way; Crusaders also had internal fights. One of these conflicts came up over the castle which sat on the site of Migdal Tzedek. Two brothers-in-law, Heribrand II and Baldwin II came to Israel during the first crusade. Heribrand and his wife, Hodierna (sister to Baldwin II) have a son named Manasses. Manasses’s cousin (Baldwin II’s daughter) is Melisende – the famous one who married Fulk deAnjou, ruled herself and renovated Jerusalem. Manasses comes to Israel in 1140, and because of his relationship with Melisende, is appointed Constable of Jerusalem in 1143 after Fulk’s death. This is a political appointeeship, apparently, as he is a terrible general and launches 2 failed military campaigns in Edessa and Damascus. In 1150 he marries Helvis of Ramle (the daughter of Baldwin I of Ramle and the widow of Barisan of Iblelin, one of the founders of the wealthy Ibelin family). With his marriage to her comes the territory of Ramle and the area of present day Rosh HaAyin. He builds a castle on the hill overlooking the headwaters of the Yarkon Stream. A large beautiful castle with two churches governing the surrounding farm land, springs, and most importantly, the road. This castle is named Mirabel – of wonderous beauty. You would think that he would be content with what he had. He, however, is described by William of Tyre, a contemporary chronicler, as haughty and disrespectful of his elders. And maybe they would have put up with his bad attitude if he hadn’t started up with his cousin Melisende and her family. He put a wedge between Melisende and her son, Baldwin III (why are they all named Baldwin?) by encouraging Melisende not to abdicate power to Baldwin III when he came of age. Baldwin III had himself crowned and, under duress, Melisende agreed to split the kingdom with him. This was a temporary situation and when Baldwin III finally decides to take the reigns of power for himself, Manasses found himself on the losing team, his beautiful castle of Mirabel taken by his cousin’s son. This was not only the end of Manasses’s stay in the castle, but the end of his stay in the Holy Land as Baldwin III had him exiled permanently, his title Constable of Jerusalem stripped from him. So, Manasses, having arrived in the Holy Land in 1140, only stays until 1162 – 22 years. The Ibelin family, which he married into, and his family – the Baldwin/Melisende family continued to have long runs in the Holy Land. He, however, did not find fame and fortune in the Holy Land and was even run out of the country. Mirabel continues to be a Crusader castle under Baldwin III for another 25 years until it is captured by Salahadin’s younger brother. In 1240 the Crusaders retake the fortress under Richard, Henry III and Frederick II. The castle, Mirabel, is captured finally in 1260 by Baybars, who levels it to the foundations. It remains in ruins for almost 600 years until the modern period and is rebuilt in 1852. Today the ruins of Mirabel, renamed Migdal Tzedek after the sheik who resided there in the 19th century, stand forboding over the road to Rosh HaAyin. Despite the long run of Crusaders in the Holy Land, the vision of Crusader knights and ladies gracing Mirabel’s halls, noble families vying over her control, exists only in the imaginations of her visitors.